Do you need to re-stock your first aid kit? Need automated external defibrillator’s (AED) or training in how to use them? Do you need a workplace safety audit? Do you need WorkSafe BC approved first aid certification or training in a Red Cross course? Do you need food safe level 1, mask fit testing, WHMIS or TDG training / certification? All of these services are available with VFA at the Coquitlam, British Columbia training centre. Purchases, registration and even on-line training is available on the vancouverfirstaid.ca website. On-site training and in-class training is also available. Even new parents looking for private infant CPR courses can have a certified Red Cross teacher come to them for private training. Whatever first aid services you need in Coquitlam VFA can surely provide with it’s new expanded location in the heart of the Coquitlam business district. 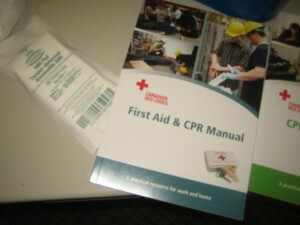 Participants that enrol in first aid and CPR training will receive a take home manual. What Services are Available at the Coquitlam Office with VFA? The training centre is located in the centre of Coquitlam with easy access to public transportation and nearby amenities. What is the difference between OFA level 1 and Emergency First Aid? The courses are almost identical in content. Emergency first aid is recognized throughout most of Canada but may not be recognized by your workplace in British Columbia. Occupational First Aid level 1, offered as Red Cross WEFA (Workplace Emergency First Aid) with VFA, is also a one day course but it is recognized by WorkSafe BC. These two courses confuse many customers. VFA strongly recommends that you talk to your employer to determine exactly the course that you need. Both courses are offered as some of the many services offered in Coquitlam British Columbia through VFA.